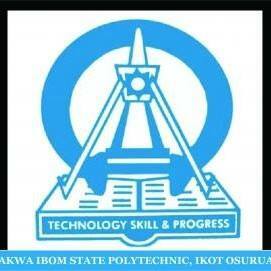 Akwa Ibom State Polytechnic, Ikot-Osura [Akwa-Ibom Poly] National Diploma, ND Evening/Part-Time Admission Form, Admission Requirements, Application Guidelines, Screening Dates, Time and Venue for 2018/2019 Academic Session. Applications are invited from suitably qualified candidates for admission into the Two-year National Diploma Programme of the Institution for 2018/2019 academic session. 3. SCHOOL OF COMMUNICATION ARTS · Mass Communication Five credit passes in English Language, Literature in English, Mathematics and any three other subject from History, Literature in English, Commerce, Economics, Government, Fine Arts, Type Writing and Principles of Accounting. · Civil Engineering Technology Five credit passes in SSCE or its equivalent which must include Mathematics, Physics, Chemistry, Biology and at least a pass in English Language obtained in nit more than two sittings. OR The National Technical Certificate (NTC) in electrical trade with credit passes in Mathematics, Physics, English Language and two other subject. · Urban and Regional Planning Five O/Level credit passes in Mathematics, English Language, Physics and any two subject from Chemistry, Biology / Agric Science, Geography, Economics / Commerce, Technical Drawing, Fine Art. 1. Candidates should visit the School website http://www.akwaibompoly.edu.ng , click online Application, then generate an invoice with the following details. 2. Candidates should go to any commercial Bank in Nigeria to purchase an electronic application pin (RRR Number) for ₦7,000.00 (Inclusive of Bank and other charges). 3. Using the pin, visit http://www.akwaibompoly.edu.ng to fill and submit the application form. Download and print the acknowledgement slip. 4. All applications MUST be concluded not later than three week from the date of this publication. Applicants can start and complete this process anywhere in the country. All shortlisted students will be published online and undergo a screening exercisE. Akwa Ibom State Polytechnic, Ikot Osurua that the Admission Screening Exercise has been scheduled for Saturday 5th January, 2019.